Can Monster Hunter: World Fans Enjoy God Eater 3? It isn’t really controversial to compare Monster Hunter to God Eater. The two series have been running alongside each other for several years now, with other competitors, such as Koei Tecmo’s Toukiden, stepping up to the plate as well. But God Eater has maintained its solid number two spot, and with God Eater 3 debuting as a high quality console exclusive, that doesn’t seem to be changing anytime soon. However, what has changed in all this time is where Monster Hunter stands. It isn’t just the number one game in its genre, it’s the number one game at Capcom full stop. 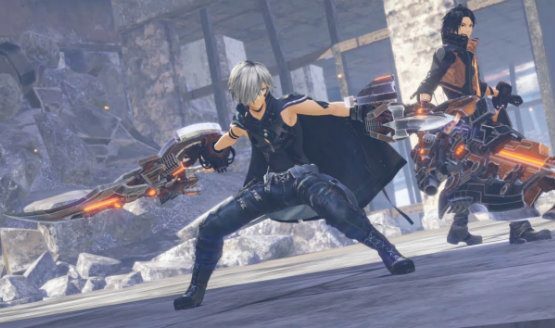 So what does that mean for God Eater 3? With Monster Hunter, by “change” I refer to the arrival of Monster Hunter: World. While that game is still thoroughly Monster Hunter, it managed to flip the script in how that series is perceived by the general gaming audience. The way it presents itself, and the way the formula is tweaked to make it seem more “casual” on the surface, led to an explosion to the tun of 11 million copies sold. Despite Monster Hunter: World still being much more complicated and unfriendly compared to the average, online AAA game, people were suddenly willing to engage with that complexity, thanks to some quality of life features, smart marketing, and perfect timing. But by now, Monster Hunter: World has more or less run its course. The content stream is pretty much over for the main game, though Capcom does have a full expansion on the way. But that expansion won’t be landing until later in 2019, so the fans had to find something else to do while they wait. Enter God Eater 3. While Bandai Namco titles always come with that “niche” branding practically on the box, there’s no denying the company has grown in prestige over the course of the PlayStation 4. This has resulted in more visibility for its library overall. Curiosity and hunger for more Monster Hunter-like experience could make this God Eater‘s chance to shine. Why bother? Naturally, I would argue that God Eater 3 isn’t just more of the same. Otherwise, this article probably wouldn’t need to exist. Nearly every aspect of Monster Hunter: World one can think of has a parallel of sorts in God Eater 3, for better or worse. This is not just a derivative copycat, it’s a take on the genre or style, an interpretation of it that seeks to stand out by doing things differently. 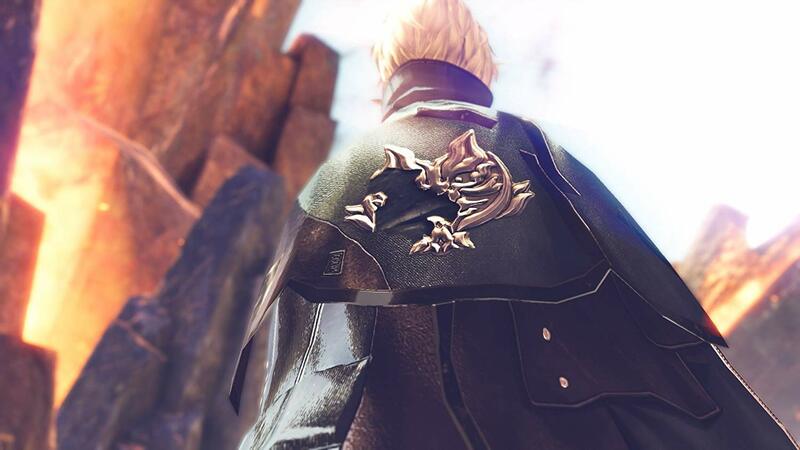 While being different is something you’d expect from a derivative work, God Eater 3 is often different in that it flies off in the opposite direction, slamming on the proverbial gas pedal. As a fan of “character action” games, God Eater 3 speaks to me in my own language. This is a huge, fundamental difference from a Monster Hunter of any subtitle, as those games are more about being careful, picking your shots, and scrambling to survive. In God Eater, the player is the feral creature backed into the corner, and the game provides the tools to properly lash out at the otherwordly forces threatening extinction. 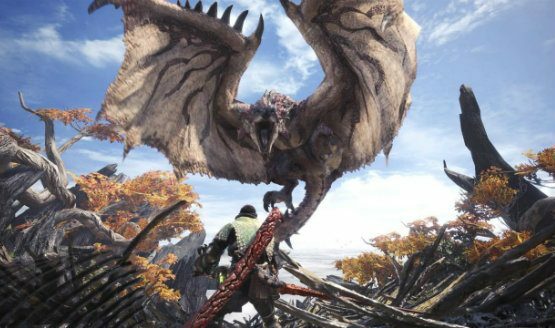 In Monster Hunter: World, you have a relatively simple moveset. There are only so many outcomes to pressing buttons, and the real strategy comes from knowing when and where to press those buttons. It takes ten years to swing a weapon once, and you need to make sure that swing counts. Even when you score a knockdown and you get to wail on a giant dinosaur for a few seconds, you aren’t exactly dialing in combo strings. Monster Hunter wants the players to feel like they’re actually trying to take down a real, massive, force of nature. Meanwhile, God Eater is Anime. Nothing about the world or its characters is grounded in reality in a gameplay sense. To that end, most of the gameplay is capitalizing on openings, and knocking an Aragami down is more of a bonus than a goal. You can fight on the ground, you can fight in the air, you can literally have your weapon produce a mouth and take a bite out of a monster (and get some wild bonuses as a result). This is a combat game, through and through. If you want to play fast and furious instead of cool and meticulous, you want to give God Eater 3 a whirl just for that reason. To that end, unlike Monster Hunter: World, in God Eater 3 you have options. There are verbs in there that you have to not only manage, but study and learn so you can yank them out of your bag of tricks at a moment’s notice. This includes building up to Burst state, in which “eating” your enemies fills up a meter that gives you even more options. In Burst, you can double-jump, use multi-context special attacks, swap to your gun and use special shots, and more. This is in addition to a dashing move that may as well be short-distance flight, your regular combo potential and dodging, and chances to literally change the physical properties of your weapon. God Eater isn’t just “Anime” because you’re aggressively darting around impossible monsters and racking up combos with living weapons. It’s also full of high concept narrative ambition that assaults the player with made-up words and loud, over the top dialogue spouted by characters bonding over their existential suffering. While Monster Hunter is more concerned with drawn-out brawls against enemies that can take upwards of thirty minutes or more, God Eater 3 has you in and out of missions in half the time or less. All that extra time is taken with consistent exposition delivered through cutscenes, something Monster Hunter: World doesn’t do until deemed absolutely necessary. That leaves me looking at two core differences between God Eater 3 and Monster Hunter: World, and these differences are significant enough to appeal to different kinds of tastes. Monster Hunter: World is more of a grand, epic experience that wants you to soak it all in take your time figuring it out, collaborating, and learning granular details. Meanwhile, God Eater 3 wants to tell you a story and feed that story with more arcade or character action-style combat. You’re in and out of missions super quick, and spend more time smashing buttons than planning your approach. You have friends with you, but it’s more of a brawl than a war. Both entries are probably the most accessible in their respective series, with God Eater 3 literally scorching its narrative earth right away, and Monster Hunter: World changing many of its fundamentals to appeal to a wider audience.